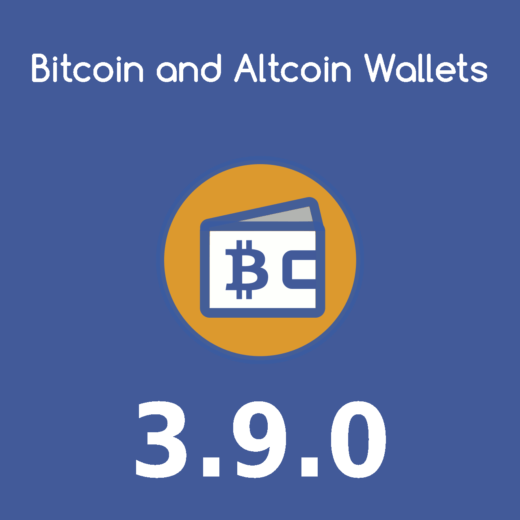 New developments in version 3.9.0 of Bitcoin and Altcoin Wallets for WordPress. Version 3.9.0 of Bitcoin and Altcoin Wallets for WordPress features a number of improvements that need to be discussed. Most of the existing wallet shortcodes utilize the plugin’s JSON API to display data. This data is live: it is refreshed via polling this JSON API. The end user can select the current cryptocurrency, and this selection affects all the shortcodes throughout the page. accept a symbol attribute that specifies the coin to display information about, e.g. : symbol="BTC". It is now possible to display information about a single coin per page. are available via the attribute template="static"
The shortcodes for which a static template is now available are: [wallets_deposit], [wallets_balance], [wallets_transactions], [wallets_account_value], [wallets_rates]. Please refer to the shortcode documentation for details and examples. With these actions a programmer can cancel or retry a transaction programmatically from theme or plugin code. Please refer to the PHP API documentation for details and examples. New administration screens: Deposit addresses and user balances. Deposit addresses: All the deposit addresses per coin and user are listed in a sortable table. User balances: All the user balances per coin and user are listed in a sortable table. Great Work, this is the best. Thanks. This is an excellent improvment of the plugins quality and coverage of the domain of application. I’m very happy with the new backend features for deposit adresses and balances.